One of the common questions, when implementing automation for operations is - how can we send an email notification to a person that such and such is happened? It could be for example Purchase Order is created and we want short e-mail to get send to procurement chief. 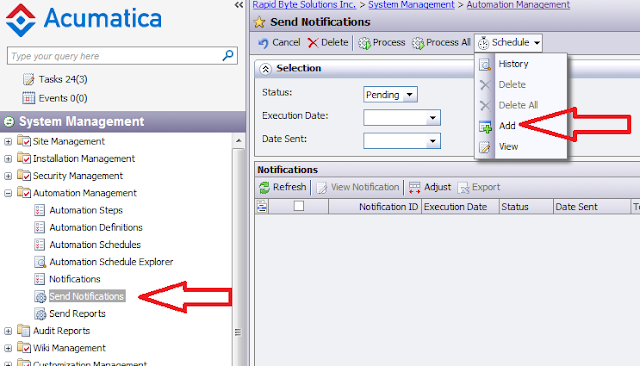 Using Notifications in Acumatica is a natural answer to all that. Task: I want to send a notification to Steve Church once the purchase order status is changed to Open (meaning PO is approved/printed). Step 2. Now need to create a notification in system manager. Please note, Screen ID should be Purchase Order, since we want changing of the status in THIS screen to trigger a notification event. In the Message body I want to be mentioned that system should include actual PO number that was created, so I use standard Template Notification syntax of ((fieldname)). I also want actual PO Form to get attached to my e-mail, so user can review it, I just added Data Source: Report with format PDF. 3. Now we have to decide if we send these notifications using a schedule or manually calling a process. I wanted to use a manual process, but schedule can be added that will trigger it every say 1 minute. I think this is the first Acumatica-related blog online. Congratulations. It is great to find this blog. I do have a question though: how could I configure the email addresses dynamically, for instance, I would like to send a notification to the owner of a support case after it has been assigned to them. Hi Art, you can use dynamic addresses when configuring notifications. Just choose the type: Document. Then choose the field from the document to specify the e-mail address where to send to. hi again, did you have user manual or training manual using acumatica. did you have encountered more problem of using this acumatica. thank you. Hi, Acumatica does have training and user manuals. Join our team of VARs or ISV partners and you will get access to Acumatica University portsal. I was just about to pull my hair out because I had no idea where did all the notifications went in the system and thanks to your blog - it's been found! The simplest thing sometimes isn't so obvious for a novice, thank you! Question how did you prevent sending notifications each time the form was saved? We tried a similar notification on the project screen to notify the Project Manager when the project was made active, but each time the form was saved a new notification was sent. Please note the Fields tab. It has the form's key values. On change of those the trigger event will get fired, then conditions will be evaluated based on Conditions tab. So in your case, make sure you added into Fields the form's key. Notification will get out ONLY when the key from Fields tab get changed. Cheers. Notification is get sent directly without pressing anything. It gets sent based on Fields tab values change PLUS conditions met. All the best Tran. Hi Rick, could happen actually, but you can try adding field into condition like created date time, you can add this field by customization to the form, it will be available to add to condition. Created Date Time is a standard Acumatica audit field. How the mail is auto send by notification template? I have added activity but it is for a particular record. Want to send mail for all records. Hi Kaveri, mail will be auto send once you created a scheduler under Send Notification process. See the Schedule icon, click it, then create a scheduler to send every 5 minutes. Once you created a scheduler, mails will get send for all records.